It was what started out to be a cold and gloomy day in the city of Melbourne, which meant it was time to bring out my trench coat to go exploring in the CBD. The reliability of the public transport made it quick and easy to begin my adventure of Bourke St Mall, China Town, the Queen Victoria Markets and the Melbourne Aquarium. Melbourne, being the fashion capital of Australia, has a broad range of clothing unseen in the shops I am used to in Brisbane. Being the middle of the year, there were some fantastic sales occurring. I bought a fantastic woollen jumper on sale at the Witchery section of David Jones, which consequently kept me warm for the rest of my trip. If it was not for my university student wages I would have bought much more. Following this, I met up with a friend and we went to lunch in a restaurant in China Town on Little Bourke St. There were at least 20 different Asian places we could choose to eat at, so much so that I forgot the name of the place we ended up at. My sweet and sour chicken was delicious. Needless to say I felt like I did not feel like I was in Australia and it was a cultural experience. I would recommend anyone who is in Melbourne to randomly choose a restaurant at China town and see how they enjoy it. In order to burn off our lunch, we walked down Elizabeth St to the Queen Victoria Markets. As Friday is their busiest day, there were a variety of stalls. There were meat stalls, fruit stalls, confectionery stalls and live birds for sale - not to mention a giant retail section. There were many handbag stalls, however I was wary of the quality of supposably 'leather' bags and refrained from buying one. One aspect that disappointed me was that we were not allowed to take photos. Unaware of this, we took photos of ourselves wearing some extremely goofy beanies that were on display. We were rudely informed that photos were not permitted. This is definitely somewhere to get the loved ones some quirky gifts, just leave the camera at home. Our last stop was the Melbourne Aquarium where we spent an hour looking at the penguins, sharks, stingrays, and other creatures of the sea. 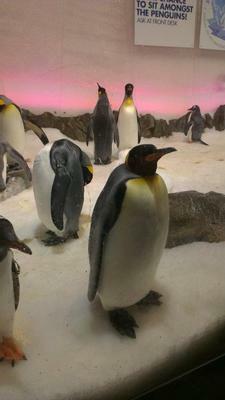 The penguins gave us our money's worth of entertainment as they were energetic, charismatic and extraordinary adorable. I would recommend going here if you have children or are simply an animal lover. By the time we had finished here, it was time to go home after a fulfilling experience of what the heart of Melbourne has to offer.